Create a Custom Aquarium Design that Complements Your Residential or Commercial Space! A custom aquarium is a great way to brighten up any space. But have you ever seen an aquarium that doesn’t look right? Something about it was off and made it seem out of place like it belonged elsewhere. You may not have realized it at the time, but the issue may have been that the aquarium’s design conflicted with the theme or mood of the room. Custom aquarium design is crucial because a few minor mistakes can add up to undermine an aquarium's overall impression. Ideally, the aquarium should complement the overall design of a space, and many factors contribute to finding that perfect compliment. We hope you find this guide useful as you begin planning your custom aquarium. Without further ado, let’s start our journey by looking at the difference between business and home aquariums. Do you want a Business or Home Aquarium? You may be eager to dive right in and start designing your dream aquarium, and that’s great! We love your enthusiasm. But before you start letting your imagination run wild, we should first consider where you want this aquarium to reside. A beautiful custom aquarium can be the perfect decoration for either a commercial or residential space. The key is to make sure the type of aquarium you choose aligns perfectly with the purpose of the room. Otherwise, you could wind up regretting that beautiful piece of living art because it just doesn’t fit in. Here are some tips to keep that from happening. The first step to home aquarium installation is finding the right room for your tank. Since most custom aquariums are difficult to move once installed, it’s essential that you are sure about your choice of location. Try to choose a room where you know you’ll get the most enjoyment out of your tank. 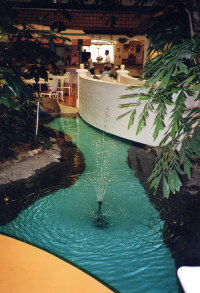 Aquariums are notorious for the calming effect they can have on a place. So, it may be a good idea to choose a room where you can sometimes feel stressed, such as an office or kitchen. You should also factor the current décor of a room into your decision. If a space already has a hectic style, then an aquarium with its bright colors and moving creatures might not be the best fit there. Remember, you always want your aquarium to complement a space, not distract from it or clash with it. When choosing a room, you should also keep in mind that your fish should be comfortable there too. Locations in your home that experience significant temperature fluctuations throughout the day might harm your fish. Therefore, you may want to avoid installing the aquarium near stoves, radiators, air conditioners, or windows that receive a lot of direct sunlight. Remember, when in doubt about a room, you can always consult the aquarium design experts at Living Art Aquatics. We will help you determine the best spot in your house to install your aquarium. A custom aquarium is also an excellent choice for your business because of the joy it can bring your customers. Whether you want to brighten up a waiting room or spice up a restaurant, a beautiful fish tank is perfect for cheering people up. If you want an aquarium for your business but aren’t sure where to put it, you should try to put yourself in your customers’ shoes. Picture yourself walking into your office for the first time. Think about how you would respond to seeing an aquarium in different locations. Furthermore, consider how people tend to feel when at your business. If there are spots where stress and anxiety tend to be high, then those might be advantageous spots for your aquarium. For example, at a dentists’ office, it might be a good idea to post the aquarium so that patients can admire it while having their teeth cleaned. Or if people often must wait for tables to open up at your restaurant, then an aquarium could make the wait less annoying. Learn more about the health benefits of fish tanks. Where Should the Aquarium Fit in this Space? Now that you’ve picked the prime location in your home or business, it’s time to figure out how your aquarium should fit in that space. Should the aquarium be the center of attention, dominating the room as its focal point? Or should it be an accent or component in the room’s overall design? Center your custom aquarium to attract attention or mount it to accent the space. If you want your aquarium to draw a lot of attention and be as vibrant and beautiful as possible, then you can start by considering what size and shape the tank will be and where it will go. One effective way to make a big statement is by placing an aquarium at the center of a space, especially a large cylinder-shaped one that you can see into from any angle and any part of the room. Alternatively, aquariums set into a large section of wall can similarly draw focus. Not all aquariums demand so much attention, though. We’ve all seen the familiar waiting room aquarium, unobtrusively adding some life to an otherwise dull doctor’s office or hotel lobby. There are more oblique ways to position your custom aquarium design, though. For instance, note that since an aquarium is glass and water, you can see through to the other side. This makes it great for use as a barrier that closes a space off physically but not visually. You can place a long aquarium as a divider between sections of seating in a restaurant to create a distinct separation while keeping the open feel of the space. You also can set an aquarium into the corner of a hallway intersection to open that space up a bit. There are many ways to use a custom aquarium design to subtly manipulate a space’s layout, light levels, and overall dynamic. Custom aquariums can come in many different shapes. 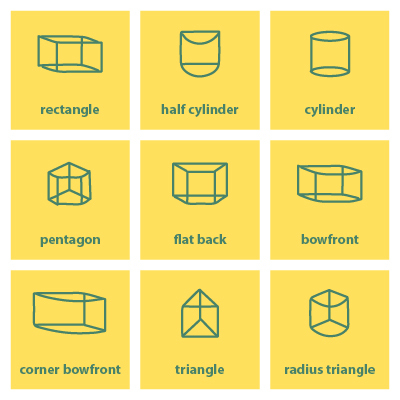 Don’t limit yourself by settling for an ordinary rectangular shape. Custom aquariums can come in many shapes and sizes. The key is to let your imagination be your guide as you look at the space where you plan to put it. When choosing a shape, remember that the best design will accent the overall shape of the room around it. 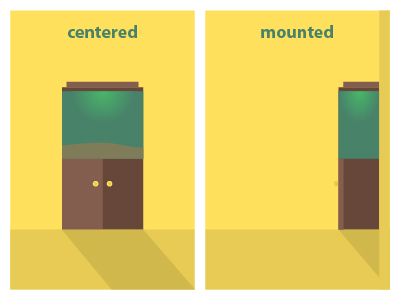 For example, if you want to put your aquarium in a corner, a form that hugs that corner, such as a curved bowfront or a pentagon, is an excellent option. Conversely, a full cylinder might be a good choice for a room with more rounded walls. Find more ideas for making the best use of your space. Should You Choose a Glass or Acrylic Custom Aquarium? Once you have decided on the size, shape, and location of your tank, you must next determine if you want a glass or acrylic aquarium. To help you make that decision, here are some general guidelines for each type of material. Glass is an excellent choice if you’re looking for a scratch-free custom aquarium. It is much more scratch-resistant than acrylic, which makes it an excellent choice for hectic commercial settings. So, you may want to consider glass if you’re going to put your aquarium in a location where people may bump into it and scratch it. Acrylic, on the other hand, tends to be a more advantageous choice for large, uniquely shaped custom aquariums. It is more malleable and shatter-resistant than glass and provides a more unobstructed view. So, if you want to make a sizeable home aquarium, you may want to consider acrylic. Just remember that it scratches easier than glass, which can make cleaning it difficult. Click here to learn more about the differences between glass and acrylic. Are You Partial to a Saltwater Aquarium or Freshwater Aquarium? Now that you’ve established the outside of your aquarium, it’s time to think about the inside. What types of fish do you want to admire in your custom tank? The answer to that question will determine whether you should choose a saltwater or freshwater aquarium. 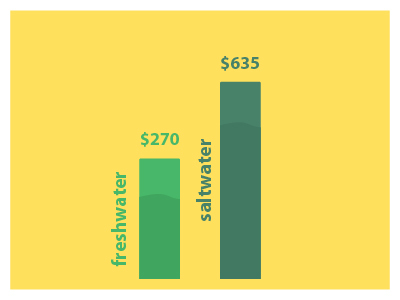 Saltwater aquariums tend to cost more than freshwater aquariums. A freshwater aquarium is an excellent option for the aquarist on a budget. Startup costs usually average around $270, and they are easier to maintain than saltwater aquariums. The only drawback of freshwater tanks is that they feature less exotic fish and plants than saltwater tanks. People interested in custom aquariums in Cary, IL often want fish in their tanks that they don’t usually see in the area’s lakes and rivers. While there are plenty of great freshwater fish to choose from, saltwater tanks offer more diverse options. You can’t go wrong with a saltwater tank if you want a vibrant custom aquarium that will catch people’s eyes. However, you should keep in mind that saltwater aquariums require a lot of work to maintain. Startup costs average around $635 and are often more than that due to unexpected complications. Still, if you love breathtaking aquarium views, then you probably won’t mind maintaining your saltwater aquarium. The extra work will be worth it for that beautiful undersea work of art. Learn more about the differences between freshwater and saltwater tanks. How will You Maintain Your Custom Aquarium? Before you install your fish tank, you need to make sure you can take care of it properly. Regular maintenance is crucial for the health and beauty of a custom aquarium. Essential maintenance tasks include cycling your tank, performing monthly water changes, feeding your fish correctly, maintaining consistent water temperature, and more. Click here to learn more about how proper maintenance. What About Filtration, Lighting and Other Factors? 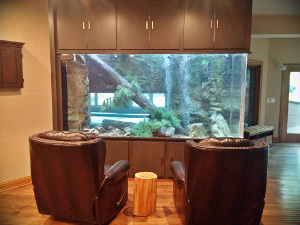 There are many other factors you should consider when designing a custom aquarium. Here are a few of the most important considerations to get you started. Another essential factor to consider is the filter for your tank. There are many different filtration options on the market. The best filters will provide your tank with biological filtration, which facilitates the natural bacterial processes of your tank. The filter you choose should also eliminate ugly particles from the tank and get rid of dissolved wastes. Remember that your tank will require electricity to function. So, as you are picking out the location of your tank, be sure to pick a spot with access to electrical outlets. You should also consider how electrical equipment, such as a filter or UV sterilizer, will look with the design. Clever designers can find ways to hide these electrical appendages for a clean and natural look. A subpar stand can compromise even the most gorgeous custom aquarium. Don’t just put your beautiful tank on any old box made from particle board. Instead, consider plywood or metal custom options that will complement the shape and size of your custom aquarium. You should also consider custom cabinetry. Tucking your aquarium into a beautiful piece of furniture is an excellent way to make it feel natural in your home. The design options are endless, so let your imagination be your guide! Like all creatures, fish need natural light to live. They also need proper lighting to look good. Thus, to maintain fish health and keep the tank looking aesthetically pleasing, you should determine the appropriate wattage for your tank. Variables to consider when determining how to light your tank include the size of the aquarium, the type of aquarium, and your budget. Click here to learn about how to best light your tank. Need help turning your dream custom aquarium into a reality? Living Art Aquatics in Crystal Lake has the experience and know how to make even the most complex custom tanks! Give us a call at 847-737-5151 to find out how we can help you.